Applicants themselves shall decide which category best fits the content of their project. Identification document – these documents must confirm the legal status of the organisation. Tangible and intan­gi­ble assets (goods or ser­vices related to the project) - e.g. purchase of trees for watershed rehabilitation; hiring community animators to be used in training workshops etc. Proposed Timelines - a proposed project timeline and calendar must be included when preparing the project proposal and it must identify distinct project phases from the proposed start date to the implementation and project reporting and conclusion. Once a project is approved, this timeline becomes a crucial tool to CCRIF and the grantee and will allow the grantee to keep CCRIF up-to-date on all project activities being executed. Project implementation should not exceed 18 months. The evaluation period for proposals can last up to 60 work­ing days (approximately 12 weeks) and proponents should take this into account when writing and submitting the proposal, as no project can be sched­uled to start before its prospec­tive approval. 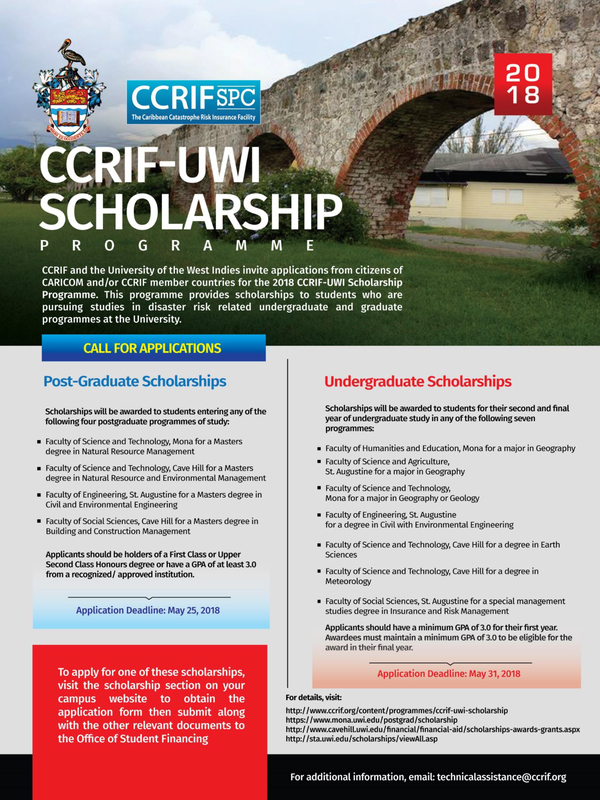 Each project will be care­fully reviewed on its own by the CCRIF TA Committee as well as in the con­text of other projects within a given timeframe (espe­cially among projects with sim­i­lar topics). 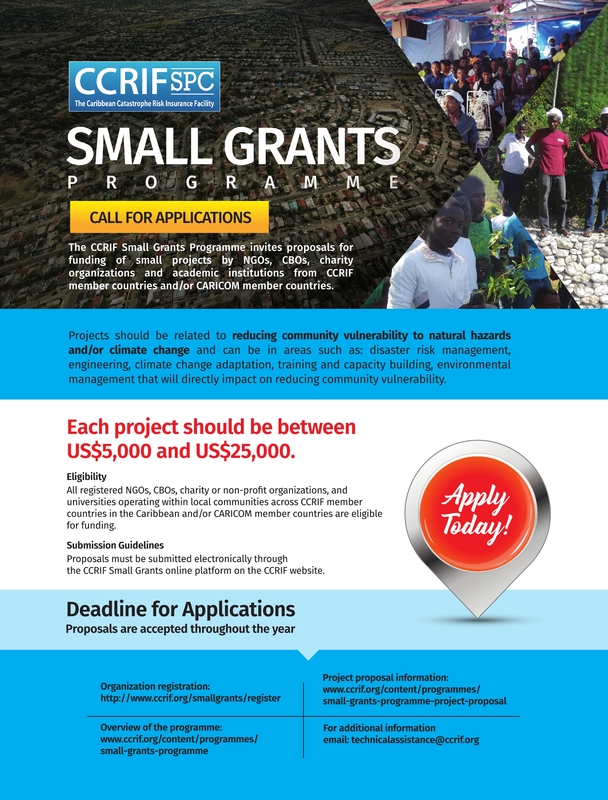 Preference will be given to those projects which reduce vulnerabilities to hazards at the local level, provide an opportunity for replicability to other communities, present innovative ideas for community disaster risk management, illustrate a clear role for community members and last but not least will contribute to achieving the vision of CCRIF. Project proponents will be informed by email of the results of their application. Additionally, a list of approved projects will be published on the CCRIF website every 6 months. The con­tract between the grantee and CCRIF will be con­cluded once the grantee has ful­filled the fol­low­ing con­di­tions: (1) allo­cat­ing a bank account which will serve the pur­poses of the project (such account can be an exist­ing bank account used by the grantee, or a new sep­a­rate bank account); and (2) accep­tance of the con­tract draft by the grantee and subsequent signing of the contract. Once approved, the grantee shall remain in con­tact with CCRIF through the designated service provider as will be stated in the contract. All con­trac­tual changes (i.e., extending timelines, changes of project part­ners, etc.) must be requested in writing—i.e., on let­ter­head paper with sig­na­ture and should be sent by email to the designated service provider. All events implemented and all documents produced as well as all public relations undertaken in the execution of the project must make reference to CCRIF and where applicable (e.g. printed materials, documents, signage etc.) include the CCRIF logo. 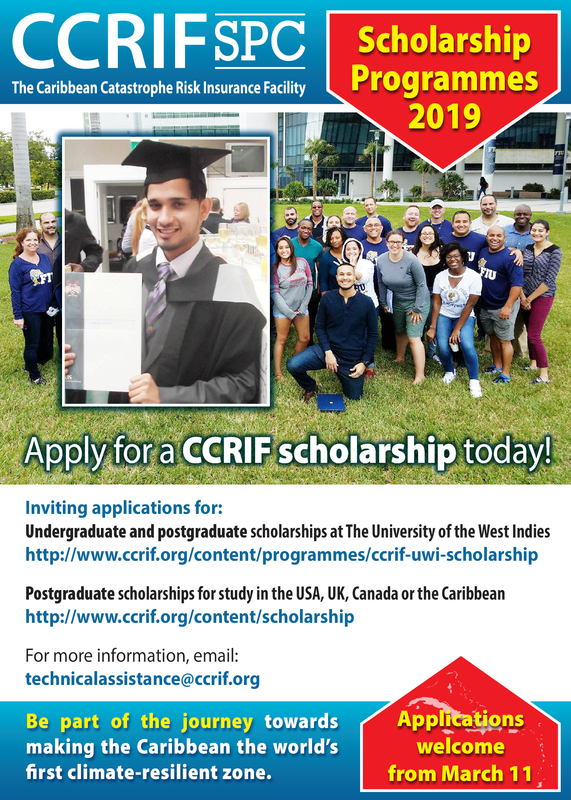 A cal­en­dar of events included within the CCRIF online platform is an on-line tool for com­mu­nicat­ing progress of a project between the grantee and CCRIF. It is nec­es­sary to keep all events up-to-date since the cal­en­dar serves the pur­pose of project eval­u­a­tion and extends the pub­lic rela­tions of an event as the entries get pub­lished on CCRIF’s website. As such, dates and locations for each event must be con­firmed in the on-line cal­en­dar preferably 10 work­ing days before the event takes place but 3 work­ing days prior to the event at the latest. Grantees are also obliged to pre­pare monthly/quarterly progress reports (the type of report will be stipulated in the contract and will be based on project duration). A final report on the project that also includes a detailed expenditure report is a requirement. Grantees must also prepare at least one press release per project output in collaboration with CCRIF. Press releases will be writ­ten in English, sub­mit­ted in the on-line sys­tem, and dis­sem­i­nated to rel­e­vant media (in consultation with the CCRIF Communications Manager). Press releases serve the facility for the pur­poses of project eval­u­a­tion and enable media and pub­lic over­sight of the projects.